Are you looking for a fun adventure game to spice up your dull hours? Well, if you want something truly exciting from the latest releases, Freddy Run 3 is just the thing for you. You must have played the Freddy Nightmare Run games before and this new version just makes the things better. So what do you have in store for you here? Let’s find out. Freddy Run 3 is the latest episode from the Freddy Nightmare Run game series that was launched by RunGames in 2015. A widely acknowledged name across the gaming world today, the portal is committed to both superior online gaming & game development. Now, let’s start with the game. Well, the protagonist of the game is our little hero Freddy whom we have already met at the previous Freddy Nightmare Run games. He loves to dabble into video games, especially the ones that promise endless hours of adventure and thrill. So, the game starts with Freddy looking forward to have another round of gaming after he is done with his homework for the day. But it’s already bedtime so his mom sends him straight to sleep. Freddy longs to play and in his dreams he sees himself as the main character of an exciting video game. And thus, the actual game begins. Freddy Run 3 comprises of 8 levels. 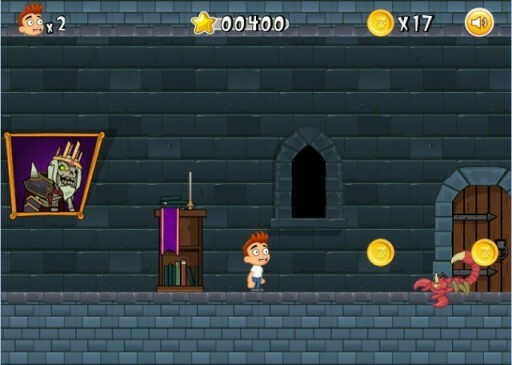 As the video game character, our little hero dreams himself as someone trapped right inside a scary haunted castle. He is trying to find his way through the several hallways & dungeons but the path to exit seems too long and too dangerous. The castle is inhabited by the evil Skeleton King (the Boss) who does not let anyone escape the building once he steps into it. He is equipped with his huge army of monster soldiers in the form of skeleton warriors, evil bats, scorpions and so on. Then, of course there are the spikes, deep pits, rising spears, swaying spiked balls and many such nightmarish dangers. The level of danger increases with each level. The moment Freddy steps inside the castle, the King starts his game. He keeps on sending his menacing warriors to kill our hero but you have to help Freddy in killing and bypassing all the dangers before him. The good thing is Freddy would be able to collect coins and enhance his power every time he jumps over the pits and spikes. Remember, our hero just has 3 lives at each level – so be careful with your every move. The keyboard is your main weapon to play the game. If Freddy has to jump to cross the pits or to kill scorpions, use the Up arrow. Hold it longer when there is a big jump ahead. Press the X key when Freddy has to shoot the skeleton army. If Freddy is able to survive till the final level after killing all the evil monsters sent by the Boss, he will ultimately come face to face with the Skeleton King himself. It will be a one-to-one combat which Freddy must win to escape from the nightmarish castle.